Make space for more happiness and positivity with this daily mindfulness planner. Maker Mo Seetubtim grew up in a Buddhist country where meditation is part of life. She understands that happiness is what we should, above all else, aim for—but it takes practice. Mo helps make sure joy doesn’t get lost in your daily to-do list. Questions in The Happiness Planner help you increase self-awareness. The focus is on making each day a positive experience and building introspection into your routine. The pages guide you to set goals and pinpoint problems. And they help you cultivate gratitude, focus on the good stuff, and track your progress. There are even inspirational quotes to set the stage for contemplation. 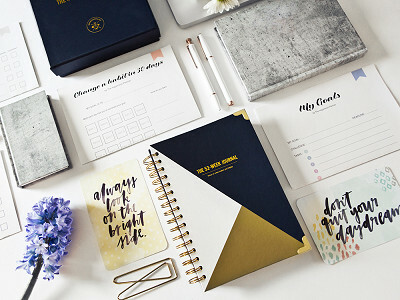 This hardbound planner is as elegant as it is inspirational. 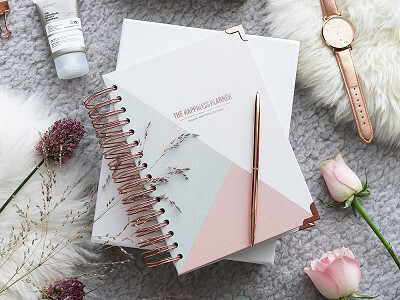 It tucks inside a foil-stamped slipcase, and includes a rose gold pen and rose gold clips to bookmark your place. You’ll feel thankful from the moment you open the first page. Hello everyone! I'm proud to introduce Happiness Planner to The Grommet. I'd be happy to answer any questions you have! Would it be good for a 15 year old?? @Carolyn Definitely. Cultivating positive thinking, mindfulness, and personal development from an early age is a wonderful thing! It also helps them increase their self-awareness, boost their self-esteem, and build self-beliefs. @Autumn Before you start with Jan 1, you have to complete our Happiness Roadmap section which contains questions and prompts that get you to think about yourself and what you truly want out of life - What makes you happy/unhappy? What are your strengths and weaknesses? What are you grateful for? What qualities/habits would you like to improve? What is your definition of success? What are your dreams? Where do you want to be 10 and 5 years from now? This is so that when you start using The Happiness Planner, you have clearer goals in mind of what you want to achieve and set the tone for the year. Then throughout the planner, you start everyday thinking about the little things you're excited about and end each day thinking about what you're grateful for and what you hope for tomorrow. At the beginning of every month, you get to plan your monthly goals. At the end of every month, you reflect on the past month, rating yourself on your happiness, health, stress, energy, and productivity levels, reflecting on the positive and negative events that happened, the lessons learned, and what/how you'd like to improve. At the end of the book, there is also a section for you to reflect on the year. As the months go on, you'll start to notice the difference in your happiness levels and find yourself happier, calmer, more positive, and more focused. I would love to try but way to expensive! 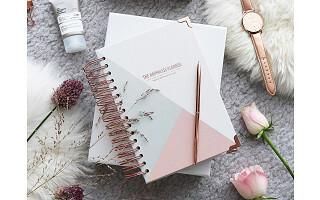 @georgia Our planner also comes with a luxurious rose gold pen and rose gold clips. It's like no other planners out there on the market with daily inspirational quotes, 2016 reflection & 2017 planning printouts, and reflection tools. I would love to get this for my daughters but it is a bit pricey. Hello! 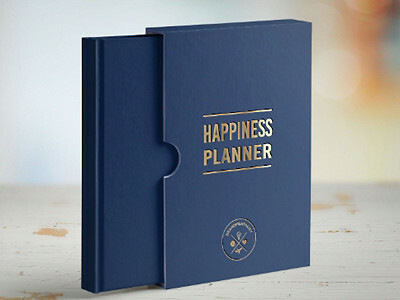 I am very interested in this concept of having a planner that encourages one to evaluate and promote happiness. However, as a law student, the daily planning pages are extremely important to me. Can you post a picture or describe what a regular page looks like? Thank you! Hi Claire, if you click on the buy button underneath the video, you can see an example of one of the pages. I have used a planner for most of my life. During my career years, the Franklin Planner worked well for me. Now that I am retired, my planner needs have changed. and this is just what I have been searching for! The price is a bargain - I plan to order ASAP. Hi Mo-I love the concept and would like to get something like this. But as others have mentioned, the issue is price. This is not a lifetime purchase- it is an annual one. 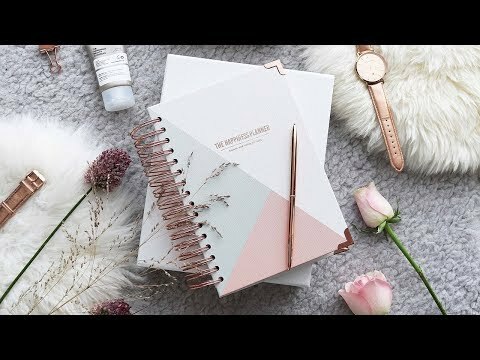 As much as I appreciate the thought that has gone into creating such a beautiful planner/journal, I hope you'll consider producing a simpler- maybe even smaller- format. Make space for more happiness and positivity with this daily mindfulness planner. 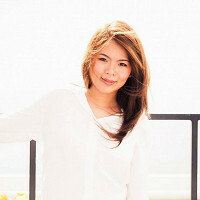 Maker Mo Seetubtim grew up in a Buddhist country where meditation is part of life. She understands that happiness is what we should, above all else, aim for—but it takes practice. Mo helps make sure joy doesn’t get lost in your daily to-do list. Questions in The Happiness Planner help you increase self-awareness. The focus is on making each day a positive experience and building introspection into your routine. The pages guide you to set goals and pinpoint problems. And they help you cultivate gratitude, focus on the good stuff, and track your progress. There are even inspirational quotes to set the stage for contemplation.